Dolores Farr has drawn upon her training as a nurse and her skills as an advocate to co-found a groundbreaking center that addresses the many needs of low income pregnant women, their babies, and families. The Healthy Babies Project operates in the Northeast neighborhoods of Washington, D.C., that have the city’s highest infant mortality rates. Under Dolores’ leadership and vision, the Project has become a model program providing an unprecedented combination of services for pregnant women and their children. Following her graduation in 1954 from nursing school, Dolores worked in hospitals and community health programs where she observed first hand that male doctors expected subservience and deference from nurses and from their patients. Dolores’ courage and her commitment to the empowerment of women led her to challenge such expectations. 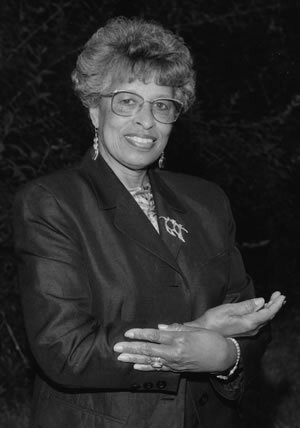 In the 1970s, she lobbied on behalf of the American Nurses Association for professional recognition for nurse midwives. From the earliest days of her nursing career she believed in empowering women to demand maximum participation in the decisions about their pregnancies and deliveries despite the tendency of traditional doctors to control such decisions. For poor, addicted, or homeless women, who have lost control over much of their lives, such empowerment can be a step toward altering their lifestyles and becoming good mothers. Dolores’ belief in the potential of the women she serves, substantiated by her participation in an earlier NIH research project, led her to start the Healthy Babies Project in 1991. The Project is guided by the philosophy that for a baby to be born healthy and remain so, the mother needs help with the full range of problems she and her family face. In her efforts to get the Project underway, Dolores faced widespread reluctance in the philanthropic community to fund services for pregnant substance abusers. She faced a Medicaid system that denies social services for poor pregnant women. Still, Dolores insisted that the Healthy Babies Project provide free services and, through her persistence and skills at persuasion, secured the funding necessary to establish the project. The Healthy Babies Project has served approximately 1,300 women since its inception. Between 80 – 85 percent of the babies delivered have been healthy and of normal weight. For program participants, the Healthy Babies Project provides a wide range of support services, including help with nutrition planning, parenting workshops for mothers and fathers, substance abuse treatment referrals, work skills development, a teen pregnancy prevention program, assistance in obtaining day care, and a male mentoring program. For women who do not enroll in the program, a drop-in center provides pregnancy tests, immunizations for babies, classes on prenatal care, practical living skills, and a place to eat a hot meal while receiving role modeling in parenting. The Healthy Babies Project is collaborating with the D.C. Birthing Center and the National Child Day Care Association to add a birthing center and day care services to its myriad services after it moves to a larger location. The Project includes an extraordinary outreach program. Staff members seek out pregnant women in beauty parlors, shopping centers, crack houses, and liquor stores, making a special effort to bring substance abusers into the program. Schools and police departments also play a role in identifying needy pregnant women. Dolores raised a son and two daughters with her late husband. Her children and four grandchildren all live in the Washington, D.C., area. Dolores Farr exemplifies dedication, perseverance, and compassion as she helps women who are struggling, against significant odds, to deliver healthy babies and become good mothers.